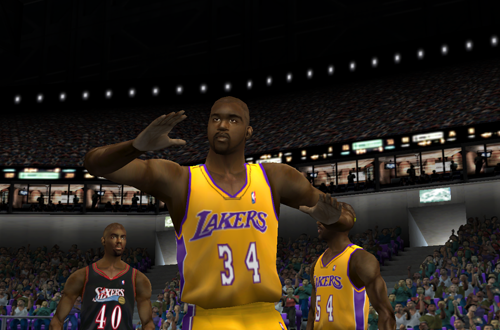 If nothing else, NBA Live 2001 was another step forward in the graphics department…for the most part. Maxing out the PC version today, you can really appreciate the visuals more than most of us probably could back then. 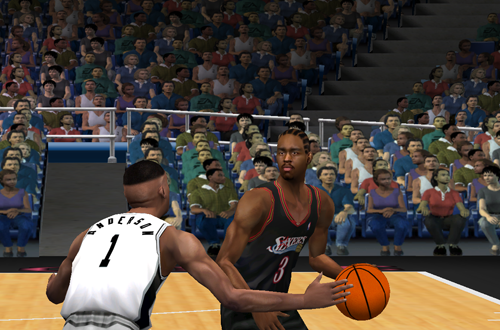 Overall, everything from player faces to stadium details were sharper and crisper, an improvement on the textures and models of NBA Live 2000. However, they’re perhaps a bit too angular, with players still looking a bit thin, and details such as jersey numbers didn’t quite have the right proportion and positioning. They’re high quality graphics for the era, but a few details are a bit off. Presentation was also a mixed bag. The menus and overlays are generally appealing, but while the presentation imitated an NBA broadcast in general, there’s no branding or direct influence from a specific television network. The referee is once again invisible, which does speed up the gameplay, but also detracts from the atmosphere somewhat. Commentary is much better though, as Bob Elliott – who would also portray Joe “The Show” Jackson in NBA Street – brought much more life and energy to the colour commentary role than Reggie Theus did. When it comes down to it, though, none of NBA Live 2001’s biggest issues were related to its presentation. No, the biggest problems in NBA Live 2001 were all gameplay related. I’ll go into them in more detail in a moment, but quite a few of them come down to overarching issues with tuning and balance. On All-Star difficulty, it was often too easy to blow out the CPU by twenty or more, unless you had the “Keep Scores Close” option enabled. Unfortunately, when you bumped the difficulty up to Superstar, the game was ridiculously cheap and generally too frustrating to play. The CPU struggled to shoot above 40% on all difficulty levels, though the higher the difficulty, the more things evened out with the user’s shooting percentages. Legacy issues included a few too many steals, though you were at least able to keep pace with the CPU in that regard. 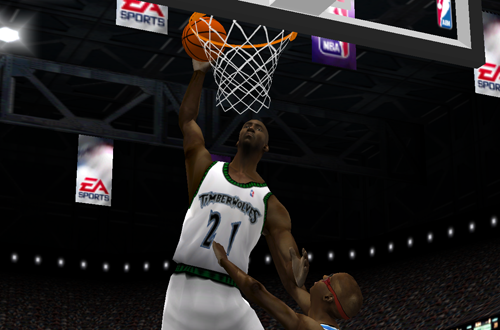 As with its predecessor, NBA Live 2001 featured some nice blocking animations and physics, but there were too many swats. Layups and dunks were still very inconsistently triggered, though at least this time pressing the shoot button when too far out would result in a running one-hander. Sadly, it was less effective than it should’ve been, as were most inside shots. Finally, players still didn’t fatigue quickly enough, so the CPU would play its starters most of the game. A lack of dead balls also contributed to the lack of substitutions. If you played NBA Live 2001 back in the day, the one issue you probably remember most vividly is the problematic rebounding. There were far too many offensive boards, and in one of the games I played, the CPU actually had seven offensive rebounds in the first three minutes. It was possible to have stretches where the offensive to defensive rebounding ratio was fairly realistic, but by the end of the game, the totals would be too even. I recall that we tried tweaking the rebounding ratings, but it couldn’t solve the problem. As with shooting percentages, rebounds were just badly tuned and unbalanced in NBA Live 2001. While the controls were fairly fluid and responsive for the most part, in some areas they were stiffer and less responsive than NBA Live 2000. It was impossible to break out of dribbling animations, so if you found yourself about to step out of bounds or into the backcourt on a crossover or spin, there wasn’t anything you could do about it. Performing a spin move after backing down an opponent felt rather stiff, and wasn’t helped by a lack of responsiveness on the shoot button when you tried to transition into a shot attempt. On a positive note, it was now possible to put the ball on the floor after pivoting, allowing you to immediately start backing down a defender. Alright, so those are a lot of glaring flaws, and I’m sure that I haven’t painted a very flattering picture of NBA Live 2001’s gameplay. Does that mean that there aren’t any redeeming qualities, and that my aforementioned “fun, but flawed” assessment is purely the result of the proverbial nostalgia filter? No, not exactly. Superstar difficulty was too cheap to play on, but All-Star difficulty could be a lot of fun. As I said, the “Keep Scores Close” option did ramp up the challenge, making All-Star difficulty tougher without the cheapness of Superstar. It was possible to have some competitive games, and the correct players tended to score the most points; if you weren’t too worried about a few statistical anomalies elsewhere, you could get used to the game and enjoy it for what it was. In the absence of gameplay sliders, ratings tweaks could sometimes help a little, but the results weren’t perfect and caused issues with Franchise Mode, so it wasn’t an ideal solution. NBA Live 2001 also has some of my favourite dunk animations, with quite a few of them still looking pretty good today. Some of the more awkward dunks from NBA Live 2000 were replaced, and there was a good assortment of basic dunks. Despite the inconsistency in being able to trigger them, NBA Live 2001 had some of the best looking dunks and layups of the series at that point in time. Rim interactions were fairly good too, even though none of the big dunks led to the breakaway rim bending down (though they did shake the board). I think it’s the less emphatic slams that impress me the most; I’d actually like to see more of them in today’s games. I’d say that the lack of a consistent challenge bothers me a little more now than it did at the time. When I was younger, I enjoyed beating up on the CPU, and blowing them out. These days, I would prefer the AI to be sharper, and more challenging. Once again though, with “Keep Scores Close” enabled on All-Star difficulty, the game is more than playable, even today. You just need to accept that shooting percentages are too low, blocking and stealing numbers are a tad too high, and rebound totals aren’t properly balanced. NBA Live 2001 is still enjoyable despite its flaws, though it admittedly doesn’t hold up as well as some other older games because of them. Game modes and features in NBA Live 2001 were a mixture of pleasing additions, and frustrating subtractions. Franchise Mode returned with a new three-team trade function, which was also available when editing the default rosters. It can be tough to use since you can’t propose trades that involve players moving between two CPU-controlled teams, but just as in real life, it was a viable way to get trades to work under the salary cap by making two deals at once. 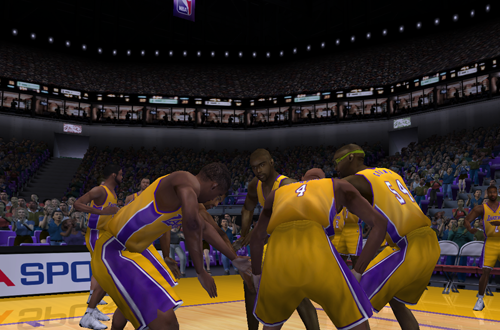 It was an underrated feature, and it’s a shame that it hasn’t been seen since NBA Live 2001. Other than that, and the ability to change teams between seasons, Franchise Mode was mostly unchanged. In addition to the three-team trade function, roster management also benefitted from two other useful additions: the option to disable automatic roster re-ordering, and the ability to have less than twelve players on the active roster. Both were particularly handy when it came to making roster updates, as well as managing your lineup in Franchise Mode. Unfortunately, custom teams were removed, as was the ability to assign and remove player accessories. Face in the Game returned, though there were fewer head morphing options, and editing player weight and body type in-game was cumbersome as it involved juggling three body shape sliders. The ability to save games in progress was also lost, which annoyed more than a few gamers. Not only was it a handy feature from a time management perspective, it had also allowed us to create and share scenarios for others to play, such as gamewinning shots; essentially, an unofficial forerunner to what EA Sports are now doing with BIG Moments. On the other hand, replays could now be exported as video files, rather than simply being saved to re-watch in-game. Videos were limited to a size of 320×240, there was no sound, and despite having a 60 frames per second setting, there are slight jump cuts when the ball is passed. Still, it was quite nifty to have at the time. Meanwhile, Practice Mode and the Three-Point Contest found themselves on the chopping block, though One-on-One mode did remain. 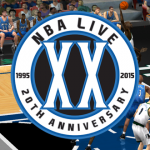 It was no longer branded with Michael Jordan’s name, though MJ and most of the historical players from NBA Live 2000 did return in NBA Live 2001, via the Decade All-Stars and Legends Pool. Thankfully, the PC version was still quite patcher-friendly, and the patching scene for NBA Live 2001 remained active for a long time, especially with NBA Live 2002 being a console-only release. Despite our complaints, the community did get a lot of mileage out of NBA Live 2001 over the span of a couple of years. Speaking of patches, that brings us to one of the most controversial issues with NBA Live 2001. At one point, EA Sports did intend to release an official patch addressing some of the most troubling issues, but plans unfortunately fell through, and no fix was ever released. Without social media and today’s technology, post-release support and communication with the development team wasn’t anywhere near as good or efficient as it is now. As the weeks passed, the community became frustrated with the lack of news on the forthcoming patch, and vague references to an eventual release. When the patch’s cancellation was announced, NBA Live gamers were furious. Unfortunately, a lot of the ire was directed at Tim Tschirner, one of the NLSC’s founders. Tim had joined the NBA Live development team prior to the release of NBA Live 2001, and in addition to his role developing the game, he was also liaising with the community to gather our feedback and provide us with updates. Because he was the bearer of bad news, a lot of people ended up shooting the messenger, and placed all the blame on Tim. The frustration and anger over the lack of a patch was certainly understandable, but blasting Tim was misdirected to say the least, especially given all that he’d done for the community. I’ve mostly discussed the PC version so far in this retrospective, as that’s what I used to play, but I would like to touch on the console versions since I’ve been able to play them in the years since. The PlayStation 2 version of NBA Live 2001 was essentially the same as the PC version in terms of its gameplay, for better or worse. It lacked Franchise Mode – only Season Mode was available – and included a Play Now option in the main menu, which was essentially just a shortcut to begin a quick exhibition game with random teams. The PS2 version also lacked 3D portraits, and overall the graphics don’t quite match up to the PC. Interestingly, the PlayStation 1 version retained the Three-Point Contest and Practice Mode, as well as the Michael Jordan branding for One-on-One. It also included the NBA Live Challenge, in which gamers are presented with statistical marks they need to try and match. An NBA Draft option was also present, which was basically a means of holding a fantasy draft before starting a Season game. Apart from benefitting from a few extra features, however, it’s essentially a slightly enhanced and updated version of NBA Live 2000 – right down to its graphics and animations – with some of the same gameplay issues as the PC and PS2 versions. As I’ve noted in my retrospectives so far, some of the older games in the NBA Live series have surprised me in how well they’ve held up, and indeed proven to be better than I remembered. For the most part, NBA Live 2001 is more or less how I remembered it, both the good and the bad. Some of the flaws are admittedly more glaring now that far superior basketball games have come along, but I was definitely aware of them – and annoyed by them – all those years ago. As a follow up to one of the best and most popular games in the NBA Live series, it’s fair to say that it came up a little short. That said, I wouldn’t call NBA Live 2001 the worst game in the series either, nor would I say that it’s a basketball game without any kind of merit. It definitely has more polish and a wider range of features than other disappointing releases, and although it came up short in some key areas, it could still be enjoyed for what it was. A patch may have resolved some of the most troubling issues by fine tuning the gameplay, but sadly, we’ll never know. As it stands, I’ll stick by my original assessment. NBA Live 2001 is fun, but flawed; a game that can be quite frustrating, yet still reasonably satisfying at the same time. Another good read Andrew, I remember the gameplay being off which lead me to editing players ratings to change it but iam not sure I’d it started doing this with nba live 2002. It’s a good thing we’d eventually get sliders in basketball games. Ratings tweaks just caused too many problems at the end of the day, and there was only so much they can do. I guess you could say that sliders sometimes have limited effectiveness, but they definitely work better than mass ratings tweaks, and don’t really have any negative side effects. If nothing else, they can be easily changed in the middle of a season.